Apologies for my absence from blogging; I've started a new job and am getting married in less than a month, both factors which are taking up energy I normally direct toward prowling around abandoned buildings like a weirdo. But I've been working on the facilities people at LSU to gain access to the historic condemned Huey P. Long Fieldhouse (if anyone can pull any strings, please do), and I got back to my prowling roots this weekend. I don't know how I never noticed this huge empty house on the corner of Government and 22nd before, but it took biking right past it to finally notice. Here in Baton Rouge, one former business featured previously still lights up their Christmas lights at this time of year. And apparently Rome Cleaners isn't abandoned after all. They have a new awning, a new paint job, and Santa's in there. I always seem to notice the signs and architecture of dry cleaners, probably because they so often fall into the fabulous, future-of-the-past category of midcentury modern. I've seen numerous examples while driving around and more recently, biking around town, the latter of which leaves me neither dry nor clean. I am making the following up because I didn't bother investigating, but from evidence available to the casual passerby today, dry cleaning boomed in the '50s and '60s, in some cases bolstered by a futuristic process called "Martinizing" that the cleaners liked to advertise in large loopy cursive lettering on their trapezoidal buildings. This amoebic sign has a flashy retro design but is probably new. But let's look at some other dry cleaners, some abandoned, some still operational, and some of course in that Baton Rouge category of "who the f knows?". In that occupied?/semi-operational category, we've got Government Street's Rome Cleaners, whose eternal sale on UNCLAIMED WEDDING G OWN S depresses the hell out of me. 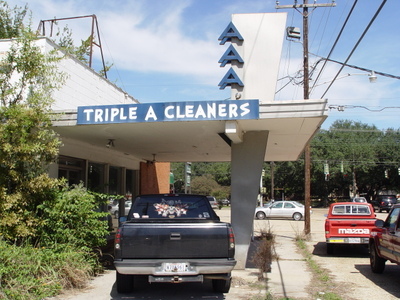 Triple A Cleaners, plus empty houses...or not? AAA Cleaners is another place with that Night of the Comet feel...as if people just vaporized, leaving their everyday items. 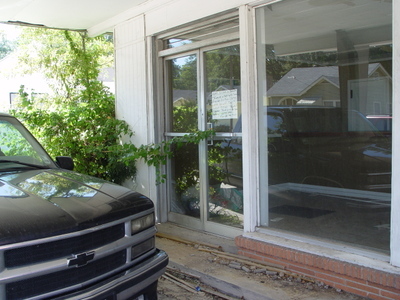 But this time...they left enough clues that even from outside, I know when this place closed down.